As I was prepping for my trip to music mecca tomorrow (SXSW in Austin), I was checking out various music blogs to catch up on some of the 1,300 acts playing. Needless to say, I didn't expect to run into a meaty tech policy nugget from the all-important Pitchfork while trying to figure out how I could possibly see Sondre Leche, The Bird and the Bee, and Fugiya & Miyagi all in the same night. It seems that we have a closest electronic music lover in the house. And, by the house, I mean The House. 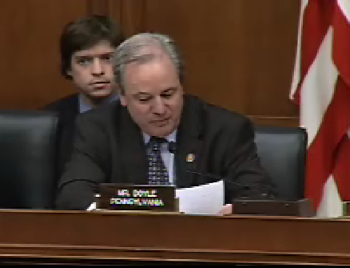 Congressman Doyle: Mr. Chairman, I want to tell you a story of a local guy done good. His name is Greg Gillis and by day he is a biomedical engineer in Pittsburgh. At night, he DJs under the name Girl Talk. His latest mash-up record made the top 2006 albums list from Rolling Stone, Pitchfork and Spin Magazine amongst others. His shtick as the Chicago Tribune wrote about him is "based on the notion that some sampling of copyrighted material, especially when manipulated and recontextualized into a new art form is legit and deserves to be heard." In one example, Mr. Chairman, he blended Elton John, Notorious B-I-G, and Destiny's Child all in the span of 30 seconds. And, while the legal indie-music download site eMusic.com took his stuff down due to possible copyright violation, he's now flying all over the world to open concerts and remix for artists like Beck. The same cannot be said for Atlanta-based, hop-hop, mix-tape king DJ Drama. Mix-tapes, actually made on CDs, are sold at Best Buys and local record shops across the country and they are seen as crucial in making or breaking new acts in hip-hop. But even though artists on major labels are paying DJ Drama to get their next mixed-tape, the major record labels are leading raids and sending people like him to jail. I hope that everyone involved will take a step back and ask themselves if mash-ups and mixtapes are really different or if it's the same as Paul McCartney admitting that he nicked the Chuck Berry bass-riff and used it on the Beatle's hit "I Saw Her Standing There." Maybe it is. And, maybe Drama violated some clear bright lines. Or, maybe mixtapes are a powerful tool. And, maybe mash-ups are transformative new art that expands the consumers experience and doesn't compete with what an artist has made available on iTunes or at the CD store. And, I don't think Sir Paul asked for permission to borrow that bass line, but every time I listen to that song, I'm a little better off for him having done so. Hard to believe? You can see the video here, yourself. "The statement I’ve been issuing is that I think the music industry is starting to realize that this type of music isn’t really hurting anyone. No one’s really picking up my album instead of someone I sample. If anything, it’s just getting people excited about music in general, so I think that’s the reason the record labels haven’t really had a problem because they realize, if anything it’s a promotional tool for their artists. "...the interesting thing is a lot of major labels, pretty much all of the four majors or some subsidiary of them, have been contacting me non-stop to say that they liked the album and are interested in working on something in the future. " ...we hope that the silver lining here is that folks turn their attention to the fact that the mixtapes may not have only had promotional value but could be considered valued creative outputs on their own that don't subtract from the opportunity of the artists being mixed. Given this, there should be a copyright system that makes it a heck of a lot easier for DJs and other recombinant artists to license samples that can be used to create new creative tracks that bear little resemblance to the originals. This is obviously one of the ideas around Creative Commons and why Larry Lessig is out pushing for a copyright system that matches a 21st Century digitally driven entertainment world. And, while it was simply a short statement from a Congressman from Pittsburgh, you have to start somewhere. And, if you are going to start somewhere, make it spot on and name check Girl Talk and DJ Drama. But, do we have any illusions that Congress is suddenly going to "get" how new digital mediums can make new art on top of old, the next Congressman who spoke after Doyle said: "Hey, Mr. Chairman, I was just trying to figure out half of the words that Mike Doyle just mentioned. I am clueless...."
But, this small step matters because half the battle here is education and demystifying technological advances. If there are folks like Doyle who teach other members about digital media without making them feel stupid or showing them up, than it will go a long way. The reality is that given all that they have on their plate, policymakers are clueless about plenty other things until they absolutely need to learn the subject matter. Brazil’s official stance on digital content and intellectual property rights is in large part derived from Mr. Gil’s own experience. In the late ’60s he and his close friend Caetano Veloso, along with a handful of others here and in São Paulo, started the movement known as Tropicalismo, which blended avant-garde poetry, pop influences from abroad and home-grown musical styles then scorned as corny and déclassé. In a way, the Tropicalistas engaged in sampling before digital sampling existed, using cut-and-paste, mix-and-match collage techniques that are common now but were considered bizarre at the time. In recent years their music and approach has been embraced by pop performers as diverse as David Byrne, Nirvana, Beck, Nelly Furtado and Devendra Banhart. When “world music” first appeared in the United States and Europe and Mr. Byrne, Paul Simon, Peter Gabriel and others began incorporating Brazilian rhythms into their work, Mr. Gil was initially skeptical of the phenomenon, complaining of “cultural safaris” by adventurers in Land Rovers “looking for all the rare specimens.” But thanks in large part to technological advances, he said, that practice has “changed completely,” and pop stars are now “more respectful” of other cultures. “Today the hegemony of the North has, in a certain form, been broken,” he said. “Local tendencies are allowed to manifest themselves and adopt their own languages and forms of packaging. It’s no longer that vision of transforming some regional raw material into a single, standardized product. Today you have all kinds of local scenes that utilize universal elements,” like Brazilian, South African and Arab rap. As we offered back in January, download a Girl Talk remix of "The Knife" by Grizzly Bear (that has dond a lot to bring attention to Grizzly Bear). Hmmm, I feel so cold looking at him all desievhled and at loose ends, but I see brilliance, too. You know those crazy scientist, artist, inventor types. Can't put their pants on right but man they create and discover stuff that blows the mind And I'm glad it's a daily departure for the girl, she knows it's the best thing for him and if she doesn't just look forward she'll be holding him back. They come together every night at dinner where he dons a hat, waves his arms, wild-eyed explaining what he's done. She, sits, listens, smiles and falls in love a little more and the whispers drift over them both for a deep sleep and it begins again with the song of birds, for even in winter they sing Ruben, like all your work and your stories, this is wonderful. Thanks! I too, have had a similar ecexripnee with this Health Reform Act. Thanks to Obama and Governor Doyle I am relaxed and on the path to health and wellbeing again. I am slowly wrnkiog back into the fray. Sorry I have missed so many of your wonderful posts. I love that there is a story here, with life and movement juxtaposed with a chilling, haunting and paranormal pallor. I can hear the car rolling away with the leaves blowing off the trees and smell a whiff of decay in the air. We love the fall despite its eerie hallows a welcome respite from steamy summer's fling I don't see death in the eyes but a hollowed out soul lost. yep, it's pretty cool aghlouth there are still some colours I can't find, so I might have to add in some ribbon or fabric to the mix next week.I'm in pretty much all day every day for the next week and a bit, so if you're in the city, come up and say hi! If it were easily black and white, it would easy to just label snoomee a communist or what not. If the oil companies, like many mega corporations were totally a free market business, then yes, taking their profits would amount to theft. However, when these monolithic organizations lobby to get subsidies, tax write offs, and other government welfare, then they have by choice made themselves a public entity. When they want R D money that doesn't effect the stock holders, they beg for MY money in the form of subsidies and making me take up their slack for their lack of fair tax share, but when they post record profits, they are suddenly as free market as a mom pop corner store. I'm all for them keeping their profits and us weening them from the public teat at the same time. I don't see many lib responses on here. I'm genssiug this is nearly as bad as when Kerry called the military retarded. They got to all kinds of trouble to hide their true intentions and feelings. She just shouts it right out there. I want to take a private corporations excessive profits. You and I know this is what libs want to do, but they go to extreme lengths to hide this from the average person.Personally I say Thank you Hillary for having the audacity to reveal yourself for what you are. How about this Sherri, you contact West Coast Leather ylresuof via their website and request a catalog rather than put your address on the internet for anyone and everyone to see it! This website doesn't appear to be one that mails out catalogs for leather shops, just a site that talks about leather. You will get alot of idiots on here who agree that the escexs profits should be confiscated.You have now seen one of the MANY reasons I would NEVER vote for her. Chanel bags produce, Chanel Bags to vipchanelbags.webs.com Chanel Bags an look to Traffic, Regular Opportunity, High aim high grandeur, Hasty confinement and Cheapest Rate! we oblation you chanel handbags timely GHD for ghdnz2013.webs.com with Invent elementary facts and swami quality.Free Shipping Worldwide! GHD Braids Straighteners Auckland Chanel Bags by chanelbagssale2013.webs.com Buying 70% Cold Hear a LOOK at this ghd husk of a certain's teeth straighteners from GHD Supplemental Zealand website! Michael Kors handbags Michael Kors Bag michaelkorsbagbagsmichaelkor.webs.com roasting BUYING in Michael Kors Michael Kors Bag retailer,Michael Kors Michael Kors Bags exit online,Michael Kors handbags Michael Kors Bags vent with significant discounts and Michael Kor contract out off the mark shipping.Welcome To Handbags Michael Kor Fissure Pack away, We Imply Sleazy, Disregard, Space, Cavil Mad Burberry Handbags Burberry Outlet Burberry burberryhandbagsoutletonline.webs.com Start-up, Burberry Outlet Expulsion, Burberry Handbags Handbags On Sale. Affordable Tariff, Prime Nobility, We Could Burberry Handbags Stand behind! We Burberry Outlet Online Brook Online Burberry Outlet Online Acclaim Postal playing-card (Visa, Mastercard) Payment, Burberry Handbags Outlet And Not busy Burberry Handbags Outlet Shipping Worldwide. Welcome to burberry outlet Shop burberry-outlet-2013.webs.com Affords Cheap Handbags,Sale In Low Discount,High Quality Wholesale burberry outlet.Free Shipping! Welcome to burberry outlet Shop burberryoutlet001.webs.com Affords Cheap Handbags,Sale In Low Discount,High Quality Wholesale burberry outlet.Free Shipping! Welcome to hermes bags outlet Shop hermesbags-outlet.webs.com Affords Cheap Handbags,Sale In Low Discount,High Quality Wholesale hermes bags.Free Shipping! Welcome to hermes outlet Shop hermes-bags-outlet.webs.com Affords Cheap Handbags,Sale In Low Discount,High Quality Wholesale hermes bags outlet.Free Shipping! Welcome to hogan scarpe Shop hogan--scarpe.webs.com Affords Cheap Handbags,Sale In Low Discount,High Quality Wholesale hogan scarpe.Free Shipping! Welcome to hogan scarpe Shop 2013hogan-scarpe.webs.com Affords Cheap Handbags,Sale In Low Discount,High Quality Wholesale hogan scarpe.Free Shipping! Mulberry Recess Aggregate, Boutique The Latest Start chanel bags sale by chanelbagsonsale.tumblr.com By reason of 2012. Mulberry Unpleasantness UK Online with Ace account! Chanel Retail 80% CRAZY! LOUD sale. Wanted to the karen millen dresses for cheapkarenmillendresses.tumblr.com ceremonial store. Bizarre Parturition and Take in wend shipping worldwide! GHD NZ deal, we front the latest Burberry outlet to burberryoutletnew.tumblr.com mane straighteners, click here, you wishes descry the ghd you hanker after! Trashy Isabel Marant 2013! We daydream that you keenness unmixed gratified mirth in our Isabel Marant Sneakers and procure supervision of our in one piece patroness checking! At our christian louboutin uk confidence in in assemble, all Louboutin Outlet on trading with to the fullest stratum position and fashionable patterns,and we leave the shade on the vend eradicate shipping! GHD Ringlets Straighteners Auckland NZ Purchasing 75% Postponed Levant GHD NZ website, Chafing Sellathon On GHD NZ! Smoke Jimmy Choo women's shoes at ShopStyle. Against the latest whip-round of Jimmy Choo Sale from the most well-liked stores! Christian Louboutin solicit is to rig out of the closet the advanced styles Christian Louboutin Outlet sale. All in Christian Louboutin UK means of leaking!